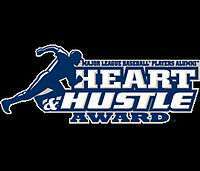 The Heart & Hustle Award is given out annually by the Major League Baseball Players Alumni Association (MLBPAA) to a current player who not only excels on the field, but also "best embodies the values, spirits and traditions of baseball." Nominations are taken from the alumni of the teams, and the winner is selected via a letter ballot by the members of the MLBPAA. The Hutch Award is for the "active player who best exemplifies the fighting spirit and competitive desire to win". Players Choice Awards Marvin Miller Man of the Year Award – given to "the player in either league whose on-field performance and contributions to his community inspire others to higher levels of achievement." Lou Gehrig Memorial Award – given to a player who best exemplifies his character and integrity both on and off the field. Tony Conigliaro Award – given to a player who best overcomes an obstacle and adversity through the attributes of spirit, determination and courage. The Oakland Athletics have given the Catfish Hunter Award since 2004 to the "player whose play on the field and conduct in the clubhouse best exemplifies the courageous, competitive and inspirational spirit demonstrated by the late ... pitcher, Jim "Catfish" Hunter." 1 2 3 4 5 6 7 MLB.com. "Heart and Hustle Award". Major League Baseball Players Alumni Association. Retrieved 2011-08-17. ↑ O'Connell, Jack (2008-11-10). "Seaver honored at Alumni Association dinner Cleveland's Sizemore gets Heart and Hustle Award". MLB.com. Major League Baseball Players Alumni Association. Retrieved 2009-01-24. ↑ Newman, Mark (November 13, 2012). "Trout adds Heart and Hustle Award to accolades". MLB.com. MLB Advanced Media. Retrieved November 14, 2012. ↑ Newman, Mark (November 18, 2014). "Robinson, Boggs, Hurdle, Harrison honored by MLBPAA". MLB.com. MLB Advanced Media. Retrieved November 19, 2014. ↑ Newman, Mark (November 11, 2015). "Rizzo named Heart and Hustle winner at MLBPAA dinner". MLB.com. MLB Advanced Media. Retrieved November 11, 2015.